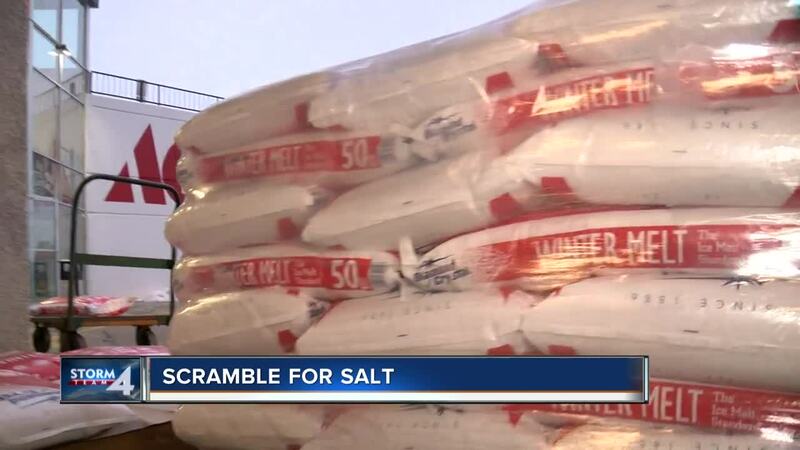 WAUKESHA, Wis. — Forget the calm before the storm, it was chaos for some people in Waukesha as they searched for salt. At the Tomchek Ace Hardware, the store went through two truck loads of salt in just a few hours. There were people lined up in their cars to get bags. “People are acting like there is a golden ticket in here from Willy Wonka the way this stuff is flying out the door,” manager Don Dishno said. The reason people were rushing to buy it is because many say they could not find it. “I have been on a search for salt for a couple of days now,” Jenny Wright said. “My sister was gone for four hours this morning looking for salt everywhere,” Tamie Hollenbeck said. “I was looking for it last night and the day before,” Michael Spellman, who was buying 10 bags, said. Many salt shoppers said they heard from Facebook that Tomchek Ace Hardware was getting in two trucks. That is when people starting showing up and buying whatever the could get. Many walking about with a dozen bags sometimes for themselves and neighbors. Others say they just have a lot of ice to cut through. Dishno says the reason for their salt shortage is Ace Hardware’s main supplier ran out so they had to buy through a second party distributor. He said their store was willing to pay the additional fees to get it, but many stores were not. Now only a few business have any salt left.